The first book Twilight pulls out of the bookshelf in the library is upside down. At brunch with the Apple Family, Applejack shoves an apple into Twilight's mouth it is green. When Twilight spits the fragments of apple out, they're red. As Fluttershy says "He's so cute!" when meeting Spike, her detaches at the back of her head. When Spike says "Well, well, well!" to Twilight, her cutie mark is missing. Ponies have cutie marks on only one side!!! It always seems it's gone! When Fluttershy walks with Twilight, she blinks and gets Twilight's eye model when she blinks again its back to her regular model. During the same scene, Twilight's eyes turn black every time she looks behind her. During the reveal of the surprise party Pinkie Pie organized, there's a section of the floor on the right that changes from red to yellow and then by segments back into red again. A grey Pegasus's eyes are crossed, standing in the background while Twilight Sparkle is chatting with Pinkie Pie at her welcome party. Soon after the episode aired, fans named the character Derpy Hooves. Lauren Faust has said that it's probably an accident, or perhaps a layout artist entertaining themselves. When Twilight is pouring hot-sauce on her cup a shot show 2 other cups filled with hot-sauce but on the next shot 1 cup is missing and the other one has a green liquid in it instead of the red one. When the Mayor says "And now, it is my great honor..", Pinkie Pie is shown without her front legs. More of a continuity error, the Cutie Mark Crusaders are shown together during Nightmare Moon's evil villain speech, before they are supposed to meet. When the flying chariot lands, Big Macintosh's cutie mark has sparkles. The first time we see Applejack, her freckes are gone. When Twilight says hello to Pinkie Pie, Pinkie's upper eyelashes are upside down. It's kinda hard to describe what's happened here. Twilight Sparkle missing her cutie mark. Twilight's hooves detached from her legs. Rainbow's cutie mark is cut. When the ponies enter the castle, there are six stone orbs on the statue, even though only five are supposed to be present. When Rainbow and Fluttershy lift them down, the sixth one is missing. Six empty places, previously occupied by the orbs, are shown after Twilight and Nightmare Moon are teleported to the hall. When Night Mare Moon says: "The night will last forever!" the moon on her armor is missing. The moment Pinkie Pie bounces up from her bowing pose her Element necklace disappears. Pinkie Pie's ears are missing right before Luna and Celestia tearfully reunite. When Luna is looking up at Celestia during their reunion, all four of Celestia's legs are missing. Fans have dubbed Celestia at this moment as "Swan Celestia." When Celestia rises from her knees during her reunion with Luna, for a split second a copy of her cutie mark is seen between her thighs. When Princess Celestia says, "Why so glum, my faithful student?" to Twilight, the colors of her mane have been flipped upside down, and then they are normal in the the very next scene. During the next sentence ("Are you not happy.."), there is a scene where Princess Celestia's tail overlaps her cutie mark instead of being straight behind her. When Luna first opens her eyes after being defeated as Night Mare Moon, her mane is on the left side of her face, yet later in the reunion, her mane has been flipped. It stays flipped for the rest of the episode. When Applejack looks like she is about to land on Pinkie Pie when she sings the Giggle at the Ghostie song, at 8:34 you can see 2 extra parts of her leg in-between her front legs. When Twilight takes out "The Elements of Harmony: A Reference Guide" from the bookshelf, her horn isn't glowing, even though she's clearly using magic to make it levitate. When the Manticore is seen by Twilight, it roars at her and her friends. When it does this, it raises both of its' paws. The thorn is missing from its' paw in this scene. When the Manticore is about to swipe at Rarity, the thorn in its' paw is still not shown. After the laughter song, when the ponies are on the ground laughing, the streak and "break" in Twilight's hair are on the same side instead of on different sides. When Fluttershy appraches the Manticore, she has Twilight's eye model. What about Rainbow Dash's eye? Ouch! What is even creepier is that Celestia seems happy about her "injury!" So, Pinkie Pie must be hiding the fact she can do simple magic tricks, right? "Swan" Celestia, missing her legs. Rainbow Dash without her tail. Rarity, with her eye liner on her face. Also, still with the previous error, Rarity has 4 eyelashes on one eye, and three on the other. Twilight using (not) magic, to levitate a book. The Manticore, about to swipe at Rarity. No thorn in his paw. I already have necklace of Harmony. I don't need new necklace! During Rainbow Dash's daydream, the number of feathers on her wings changes throughout her tricks. For example, before she does her filly flash, there are five feathers on her wings (top view), but right before she does the buccaneer blaze, there are only four. When Soarin's jaw drops to Rainbow Dash's buccaneer blaze in Rainbow Dash's daydream, Soarin' is shown sporting a long bolt emblem, which is the females' Wonderbolt emblem, of which then appears correctly in the next scene as he shakes hooves with Rainbow Dash. In the same day dream, Rainbow Dash's cutie mark appears on her Wonderbolt outfit instead of the official Wonderbolts long bolt emblem usually found on the female members. At the beginning of Rarity's daydream, she is shown wearing nothing but in the very next scene when she states, "They would never guess..." she is clearly wearing a dress. Her dress disappears again during the prince's proposal during the day dream. After Twilight Sparkle says "Go on, shoo!" Fluttershy walks off screen to the right and her tail vanishes. During the discussion of all the mane you can see how the light gray colors of the rocks changes to dark and become light again it begins when fluttershy asks for the tickets. When Twilight and Spike are at the restaurant, she rips off and eats the petals of one of the four flowers in the vase on the table. When the camera pans out, there are again four intact flowers in the vase. When Rarity says "Makeover!" Spike gets surprised, and his "ear" is missing for a second. When her friend are altogether in Twilight's house, Fluttershy has blue wings with only one feather in a group shot. Shortly before you see Spike's hand holding 6 new tickets it seems to be day outside. At ~10:26 when Twilight "pushes" the boxes away, the pink background box is visible for too long while the shot pans out. Bottom left: flashing red box. Soarin' is sporting the wrong emblem on his flank. Maybe he secretly wants to be mare? The long bolt emblem is only for female members. Male members get the winged bolt emblem. A crowd of ponies seen throwing Twilight. Two different ponies quickly replace two of the ponies in the first scene. Pinkie missing her upper eyelashes. Rainbow Dash with her wings layered upside down. When the ponies are watching Applejack herd the cattle, the main characters swap positions. At first, from left to right, is Shoeshine (a background pony), Rarity, Pinkie Pie, and Twilight Sparkle, with Rainbow Dash flying above them. A couple of shots later Shoeshine is replaced by Fluttershy. In the next overhead shot, Fluttershy has moved to in between Pinkie and Twilight; and when they're next seen, Dash is between Pinkie and Rarity, Fluttershy has disappeared, and Shoeshine is back in her original position. 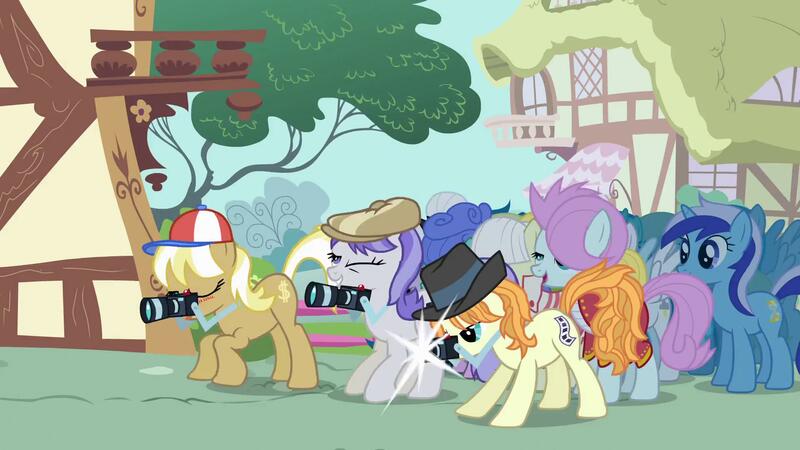 In the final shot, Rarity and Dash have swapped places, and Shoeshine is once again replaced by Fluttershy. Applejack's freckles appear off and on while she is herding the cattle. When Rarity is levitating the banner for the celebration, there are orange ribbons on the banister of the stage. After the banner is up and the camera zooms out, they are gone. When Spike offers Twilight a worm filled cupcake, his pupil is layered incorrectly. The apples in Applejack's baskets change colour between scenes when she believes shes finished harvesting. After finishing harvesting, the bottles of apple juice change size and position between scenes. When Rainbow Dash is tiptoeing away from Pinkie, a section of her tail is cut out. After emerging from underwater during her pursuit of Rainbow Dash, Pinkie Pie is wearing a scuba mask, snorkel, flippers on her front hooves, and "water wings" (inflatables worn on the upper arms). When she raises her front legs while saying "totally fun," the water wings vanish. When she lowers her legs again, they're back. When Rainbow Dash sighs and says "Okay..", her wings and cutie mark vanish. When Pinkie Pie pranks Rainbow Dash with the telescope, the ink splotch is on her left eye. When she looks into the water to check her reflection, the ink moves to her right eye. When Pinkie Pie gets the hiccups, her cutie mark disappears. At around 8:50, when Rainbow Dash dashes after Gilda in flight, there is one misfitting frame from a few moments before. It's also worth noting that its unknown where Gilda may have gotten the apple from as the entire cart consisted of vegetables. Lyra and Dizzy Twister were next to the green tent when Fluttershy ran away crying, but after Gilda flies away, they are missing. After Pinkie Pie says "Rainbow Daaash! ", her wings disappear. At the beginning of the episode Twilight is reading a book, but she is turning the pages in the wrong direction. Something wrong with the window? Oh no! My tail's been cut! Great. Now my wings and cutie mark are gone. Hey! My wings can disappear too, Dashie! How can a cart of corn and potatoes turn into an apple cart? Pinkie's enjoying Dashie's misfortune today. Rainbow Dash without her wings. 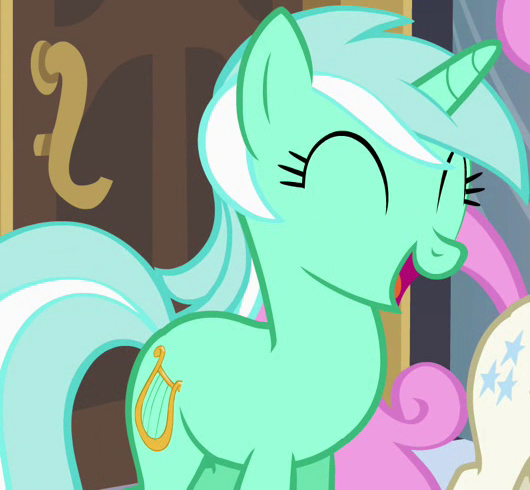 In the first scene Trixie's in, you can see the wand portion of her cutie mark on her inner thigh. You see the cutie mark on her thigh in the last scene as well, but it reveals a part of the moon. When Rainbow Dash looks at Applejack the back part of her main is colored red and orange. When usually its green, blue, and purple. Trixie's tail vanishes on and off a few times as she shows off her fireworks. Right after Trixie, yet again, refers to herself in the third-person and calls herself most certainly the best in Ponyville, she is met with unamused crickety silence. Spike's zipper mouth looks like a separate object, rather then part of his face. When Rainbow Dash confronts Trixie onstage, her tail is clipped off at the bottom as she is taken aback. Most of the time Trixie is onstage, her tail is missing. Around 21 minutes in, the curls on Spike's knees change sides. Towards the beginning of the episode, Golden Harvest has Twilight's eye style. After defeating the Ursa Minor, when Twilight is speaking, Rainbow's mane is black. When we see Trixie's stage for the first time, all of the ponies in the audience on the ground have blank flanks. While Rarity challenges Trixie, Spike stands by himself when he talks about how Rarity won't back down. The next time we see him, he doesn't seem to have moved yet somehow, he's standing in front of Twilight, Applejack and Rainbow Dash. Rainbow Dash with the black mane. Brown lips? Did Trixie eat chocolate before her act? Ursa Minor's eye falls slightly outside of its outline for a couple frames. When leaping over the chasm, Rainbow Dash's cutie mark is missing the cloud. When Twilight is talking to the dragon, his nostrils are doubled for a brief period of time. When Pinkie Pie is encouraging Fluttershy to hop over the chasm, she jumps from the same side twice. Throughout the episode, the ponies' saddlebags are inconsistent. Fluttershy is outside of the cave after Twilight's negotiation falls through and before Rainbow Dash goes into the cave despite leaving earlier in the episode. When Applejack is giving Fluttershy a pep talk, Rarity and Pinkie Pie are behind her, standing next to the cave. But when the camera switches back to Applejack, they are both gone. Also, when the view switches to from inside the cave, everypony except Applejack and Fluttershy is gone. When kicking the dragon, Rainbow Dash's cutie mark disappears. When the view shows the dragon and the mane 6, the dragon's scales are cut off a bit. After the second cloud of dragon smoke hits the ponies, Rainbow Dash is temporarily seen cutiemarkless, and then wingless and cutiemarkless. At 4:54, Applejack is seen without her saddlebag while as Twilight adresses them. Later on at 5:03, Applejack is seen with her saddlebag. When Rainbow Dash is moving her head back down at 5:05, part of the lining on her ear that ends next to her mane gets overlapped by a light blue square. Rainbow's old, cloudless cutie mark. Wasn't Fluttershy hiding a few minutes ago? For some reason, Dash's "back" mane appears on both sides of her neck. The straps of Rarity's hat aren't reflected on the mirror. ...and now, the straps don't exist at all. The dragon's scales are cut off a bit. At the beginning of the episode, Daisy appears to use magic (She's a witch) to pick up a tree branch despite the fact that she is an earth pony. When Rarity dips her hoof back into the mud after dabbing some onto Twilight's face, the bottom stair of Twilight's staircase becomes layered on top of Rarity's hoof for the entire animation. Just before Applejack gets hit by the makeover face cream, she sprouts a second ear and mane for two frames until the cream actually hits her. It would be physically impossible for Applejack to hold the sticks the girls used to make smores. The sticks look as if their coming out of her hoof, And one of the marshmallows she is roasting is golden-brown, But the other two are still white. Before Twilight asks the ponies to stop playing "Truth or Dare" Rarity`s mane is still wet. Her mane can be seen dry again after Twilight reads about the pillow fight. When Applejack jumps into the bed, Rarity is launched into the air. In one of the final frames Rarity is on screen, she is seen with a fifth leg. Eariler in the same scene, at one point, while in the bed with Rarity, while her eyes are closed, Applejack has eye shadow on, slightly darker orange than the rest of her. The next time her eyes are closed, they are the same color as the rest of her coat. When Rarity lifts up her head and says, "What was that? ", the book on her head appears blue. But when she turns her head, it returns to its original brown colour. Golden Harvest has Twilight's eyes. Daisy picking up a branch with magic, despite being an Earth pony. Rarity is still using her backing away animation when running to hold Applejack. Also, Applejack without freckles. Applejack's second ear and mane? Applejack's eyelashes are a bit messed up. A third hind leg. And Apple Jack had an accident in the bed! No wonder why Rarity looks like that! At the end of Pinkie Pie's Evil Enchantress song, she stands on a clean red table, but after a close up to Twilight, Dash and Fluttershy's confused faces, there are now various desserts on the same table. When the ponies are checking their flanks Fluttershy's legs split like normal but they reattach towards the bottom. When Rainbow Dash says "I bet they went after Zecora! ", it is clear her cutie mark is missing. Upon falling down, her cutie mark reappears, but the wing glitches through her mane, her left arm disappears, and then reappears with the top corner visible. And her leg isn't missing; it's just being overlapped by her other front leg. If you look at the bottom of said leg, you'll notice that the outline there is extra thick; that's because part of it is the outline of the leg that's being overlapped. In Zecora's house, when Rarity says "You made me look ridiculous! ", Applejack is seen on Zecora's head, but she disappears in the next scene. Before Apple Bloom leaves, Applejack is on the table closest to the others, but when Apple Bloom does leave, Applejack is on a different table. After the ponies enter Zecora's house and until the end of the episode, her rings are seen on both her forearms alternately. At the beginning of the episode when the ponies are hiding, Zecora's eyes are yellow. When they see her at the end of the episode, her eyes are blue. At 4:34 Fluttershy's tail in missing. What's going on with Fluttershy's eyes? Part of Twilight Sparkle's right eyeball is visible. Her wings, they be gon-zo. Her freckles always seem to leave whenever she runs. Whoa, that poison joke is messing with her leg! First her head,now her contraption! Princess Celestia's cutie mark can be seen on her inner thigh several times throughout the episode. While moving her tornado, Rainbow Dash can sometimes be seen without the goggles and throughout the ep it appears and disappears. While admonishing Pinkie for eating all of the Cakes' baked goods that were for Celestia, the highlights in Twilight's hair switch from one side of her horn to the other without her hair traveling above or around her horn. When Spike exclaims about the parasprites messing up his work at cleaning the library, the window in his close-up shot shows the night sky while in all other shots of the library in the morning, the windows show a daytime sky. When the parasprites attack Ponyville, the pony trying to garden who has her crops destroyed is wearing a plant team winter wrap up vest, which don't appear until the next episode. Parasprite at the lower left is in trouble. Why is Rainbow Dash angry at Princess Celestia? When Twilight points out the colors of the team vests, Shoeshine is wearing the team leader vest and armband. During the song, she is seen wearing just the leader vest as well as the regular vest later on. During the second chorus of the song, Cheerilee is missing a hind leg. Both of Coconut's right legs are shifting during song (4:49). When Caramel first walks up to Applejack with Big Macintosh, his cutie mark is three caramel apples. The next shot shows him with three blue horseshoes. While Twilight talks to applejack, she is seen with two ears. Two ponies Twilight rushes by after she brought the plow to life are different colors after the camera changes position. Right after Twilight says "I'm the pony for the job" the screen changes and Big Macintosh's cutie mark has sparkles again. When Mayor Mare says that winter is wrapped up on time, Colgate can be seen not wearing a vest. During the first chorus, when Rarity, Doctor Whooves and Fluttershy are singing, Rarity is in front of Whooves, yet her shadow is behind him for a short moment. Also, her shadow appears higher than his which would suggest she is behind him. In most scenes that Cheerilee appears in, her vest is green. But as the ponies are first seen waking up the animals, she is in the background with a brown vest. During the song as Derpy flies with another pegasus pony before being joined by the others, her eyes are blue. During the musical number during the second chorus,a purple pony with Derpy's hair in light green flips on the snow. In the very next scene, she is replaced by Medley . In the classroom scene at the beginning, there is a shot where Sweetie Belle is visible in a desk in the front row. In every other shot in that scene where the same desk is visible, it is a different pony. At the end of the classroom scene, Archer's eyes randomly turn green. In the party scene, there are other foals that don't have cutie marks in various scenes. So? Not every filly HAS to have a cutie mark. Apple Bloom isn't the only blank flank. Most ponies do. Applebloom, Sweetie Belle, and Scootaloo are the only ponies in the class that don't have their mark. There is a unicorn filly on the staircase when Twilight enters the party to give her 'speech', but when the camera goes back to the staircase, the unicorn isn't there. At around 1:06 Cheerilee's tail is like Fluttershy's even though it is the same style as her mane. When Diamond Tiara and Silver Spoon walk away from Apple Bloom and Twist, Silver Spoon has a second braid. When Apple Bloom is sneaking under a table, Berry Punch's eyes change shape . After Apple Bloom trips up and reveals her blank flank, her upper eyelashes disappear before she says "Oh no!" At 15:54 Golden Harvest has Twilight's eye model. Twist is seen laughing at Apple Bloom despite the fact that she's a blank flank too. When Diamond Tiara and Silver Spoon got their dress for the party Diamond Tiara's crown is missing. Rarity: Purple lips? You never said that you used lipstick, Applejack! Applejack: This is only an animation error, Rarity! Apple Bloom with no eyelashes. Between Noi and Tootsie Flute is Piña Colada. Back to Piña. And... Twist is still a blank flank, why are you laughing at Apple Bloom? Sweetie Belle got her real colors back for a moment. Silver Spoon has a weird mouth. Sweetie Belle missing her shadow. In the beginning of the episode, Rainbow Dash is in the lead in horseshoes. When Applejack throws a ringer, the horseshoes on the playing field switch. At 10:33, when the camera pans to the right, the bunting on top of the screen moves with the camera. At the start of the race, BonBon can bee seen as number 10. There are two other BonBons in the background of the beginning race scene, making a total of 3 BonBons in that scene. There are various shots where Rainbow Dash doesn't have her wings tied and in some scenes, she's missing her wings entirely. Part of Dash's foot is missing for a single frame after she stumbles over a stump. After Rainbow Dash stumbles over the stump, another wingless Rainbow Dash is seen behind Bon Bon when the rest of the ponies run past even though Dash is on the ground in the front of the scene. At 15:05, when Rainbow Dash blinks, her eyelids do not compltely cover her eyes. When Rainbow rotates the sign, the pin in the middle keeps disappearing and become visible again as we zoom in and out. At 16:53 Rainbow Dash's eyes shoot off in different directions and get tiny, like Pinkie Pie when she's crazy. Toward the end of the race one of the ground ponies is wearing her number upside-down. At 19:29, the tip of Sea Swirl's mane is missing. Seaswirl10 Talk 09:03, June 11, 2013 (UTC) When RD gets stuck in syrup the ponies run by there is another RD in the crowd. Rainbow Dash with freckles and the same expression that Applejack had when she did the barrel run; also, her wings are on her neck. Spike's right arm is all weird. As the pack speeds past Rainbow Dash, a wingless version of her can be seen behind Bon Bon. Twilight's medal disappears from one shot to the next. When Rarity says "Let me guess, Applejack." the cutie mark of Applejack is close to the neck. At the fashion show, there's a red 71 on the purple pony behind Spike's silhouette and again, The background ponies are duplicated. During Pinkie Pie's appearance in the second fashion show, right as a bow falls on her hat, a lollipop in the background skips from one position to another abruptly. When Rarity comes out from her shop to get Opal, Rainbow Dash's flank is blank. May be due to her legs positioned in a weird way and that her inner legs are showing. After Rarity says "Oh, I forgive you." at around 18:14, Applejack's eye design switches from hers, to Twilight's, then back. During the 2nd part of the "Art of the Dress" song, Fluttershy shows Rarity a picture of the design she wants for her dress. The birds carrying said design switch positions from a red bird on the right side and a blue bird on the left side to a red bird on the left side and a blue bird on the right side. When Twilight poses during the second fashion show, she has no star earring and there is no "break" in her bangs. When the audience looks up at the ponies as they rotate around, Minuette looks happy. Don't you just love it when your leg does this? Why does Opal have white eyes? Before Twilight falls into the ditch, Pinkie runs up to her trying to warn her. Before it cuts away to another shot, Twilight and Spike are removed from a frame, leaving Pinkie the only one in the picture. At 4:58, Twilight pushes items on the soapbox to the left, away from the soap bar image on the box. In the next cut, the same items are shown on the right side of the box, closer to the soap bar image on the box. When Derpy accidently drops the items on Twilight her eyelashes are gone along with Parasols and Raindrops. After Twilight gets hit by the laboratory door, she has a cutie mark on both sides of her. A third hydra neck appearing behind the Mane cast in plain view and clearly not connected to the body of the hydra. Twilight missing cutie mark. Hahahahaha, blank flank! During the preparations for the contest, when Rainbow Dash is looking for a way to delay her appearance, the gray pegasus called Derpy Hooves can be seen with the number "15" on her flank. When first shown, she's facing the viewer's left and the number, half hidden by her wing, is backward. Backstage for the competition, Derpy is seen. Then, the shot changes to the crowd. In the crowd, you can find Derpy. After the background ponies follow Rarity in the cloud factory, Applejack is shown sporting her brown cowboy hat instead of a white factory helmet while Twilight's own headgear disappears. After the previous scene, when Rainbow says "I'll never win the competition now", Twilight has the helmet on even after it has disappeared just a few seconds earlier. 18:20 Fluttershy's wings are absent. At around 20:36 when Celestia asks Twilight if she's learned anything, behind her wings is Lyra Heartstrings, a unicorn. At 2:20, when Twilight's eyes derp, her left iris and pupil exceed the lower part of her eye. When Rainbow Dash turns around to meet the Wonderbolts, her flank suddenly has the number 15 on it, which wasn't present in the shot before or the shots after. Derpy is seen as a contestant, but later on she is a spectator. When Rainbow Dash finds out she and Rarity have to perform together her lashes are missing. At 03:32, Pinkie's cutie mark is sticking out. Pinkie Pie's Cutie Mark sticking out. Where are your lashes Dash? As the crusaders enter Fluttershy’s cottage, the leaf designs on the main support beam are brown, but when they pass hammers to fix the table, the designs are green. When Scootaloo suggests to got to the everfree forest her eye shape is an oval insted of a circle. When Sweetie Belle is singing on the moon,her horn is missing,once again!!! In many scenes during the episode, Scootaloo's wings are missing. Sweetie Belle's left ear is missing after saying "I wonder what could've caused that." When Fluttershy is trying to get the Cutie Mark Crusaders back out of the Everfree forest, her cutie mark appears on her inner thigh. When Fluttershy is staring down the Cockatrice, we see her wings closed and the beginning portion of it petrified, but in a front shot her wings are untouched and open. For a second as the cockatrice appears from the bush, Sweetie Belles eyes look to be a very light blue. As the Crusaders are chasing Fluttershy's chickens, Sweetie Belle stops right besides Fluttershy as she yells "GIRLS!" but when they pan to each of the Crusaders reactions, Sweetie Belle is nowhere near Fluttershy, but rather still chasing the yellow chicken. When Twilight is turned into a stone statue, her pose alternates between standing on three or four legs. When Fluttershy knocks her over, one of her hind legs has vanished, leaving her balancing on two legs. For sevral scenes while the Crusaders are screaming, Fluttershy has Twilight Sparkle's eyes. At 20:25 one of Fluttershy's eyes has Twilight's eye design. There are a number of times in this episode where the crusaders speak with the voices of actresses that aren't theirs. Scootaloo says "Very ready!" with Apple Bloom's (Michelle Creber's) voice. Scootaloo says "I'm gonna get my mark first!" with Sweetie Belle's (Claire Corlett's) voice. Sweetie Belle says "Nuh-uh!" with Apple Bloom's voice. Apple Bloom says "Me too!" with Sweetie Belle's voice. Sweetie Belle says "Me three!" with Apple Bloom's voice. Twilight on 3 or 4 legs. Fluttershy's cutie mark, seen on her inner thigh. All of the Crusader's eye colors mimic that of Apple Bloom's during one of their cutie mark crusades via "mountain-climbing". Their eye-color reverts back to normal after they fell from said activity. When Cheerilee and Twilight enter the library, Cheerilee isn't carrying anything. When the camera switches back to her, she is carrying a saddlebag. When the Crusaders go to the Apple yard after Rarity's Boutique the library is already crossed out even before they go there. When Sweetie Belle converses with Scootaloo about the progress of the song, her tongue is uncolored after the raspberry. In the final scene after the award ceremony, half of Apple Bloom's bandana is missing, making some skulls appear to float in the air. After the talent show ends, Scootaloo's eye color is that of Sweetie Belle's. Scootaloo has Apple Bloom's eye color and she's wingless. They all have Applebloom's eye color. At :19, a short moment before Rarity reacts to seeing Sapphire Shores, her eyelids suddenly overlap her eyes. When Sapphire Shores is inspecting Rarity's designs, she has no visible cutie mark. Lauren Faust explained this on Deviant Art as a design oversight. You can clearly see the storyboards "under the sky" next to Spike's head as he drools over the prospect of eating the gems he dug up. They fall down the hole, Rainbow Dash and Fluttershy are absent from the overhead shot of Spike shouting "NOOOOOO". This is an error that is exclusive to the iTunes release. When Spike is explaining in broken words to the mane cast what happened to Rarity, the first shot from behind Spike's head shows no mountains in the background. When he finishes, the second shot from behind Spike's head shows gray mountains in the background. As the ponies charge to where Rarity was ponynapped, and Spike stands up on Twilight's back, his left leg falls out of position for a couple of frames, revealing another left leg beneath it. At the 19:43, we can't see the rope in Twilight. In the next shot, the rope is back. Looks like this is payback from rarity from Look before you sleep. Fluttershy and Rainbow Dash are missing from the iTunes release. Pinkie Pie's head disappears as she closes in to hear Spike's secret. Photo Finish's cutie mark is the same as Twilight's, and is visible on the inner thigh after Fluttershy goes with her. In the spa scene when Rarity is chatting with Twilight about Fluttershy career, a bit of her mane can be seen but when Rarity says "...please, please, please, please..." it disappears. At 14:23, The back of Twilight's mane appears on both sides of her neck. Twilight's cutie mark on Photo Finish's inner thigh. None of the ponies pulling the train have cutie marks. The pony who throws out the old pony from the salt saloon has his cutie mark visible through his mustache, and his monocle chain is floating in the air, unattached to his monocle. When the ponies are getting ready for their rescue mission, Applejack is seen tightening Rarity's saddlebag, with no saddlebag of her own. Then a saddlebag abruptly appears on her side. In the following scenes, the saddlebags disappear and reappear. When Braeburn says "They sure as hay don't want any new ones added in", his flank is blank. When Fluttershy runs towards to catch Philomena while she's falling, her wings are missing. When Fluttershy peers into her closet, Twilight, Rainbow Dash and Pinkie Pie's dresses are inside. In the beginning of the episode, Angel is on a green carpet, but then he is on an orange one a few scenes later, and he didn't move to it. Angel puts the watch down in one scene, and then it's gone in the next. Before running off after circling around the tree, Fluttershy has a lump on the side of her neck and her hair is broken. During the party scene, Applejack's hat is seen on and off. After Mr. Cake gets the cupcakes for the kitchen Mrs. Cake has the same cutie mark like Mr. Cake then her cutie mark appears on her flank. In the near end of the episode where Princess Celestia explain to Fluttershy that she should have just asked her about the phoenix to avoid that confusion, her tail animation is frozen. In the scene where Pinkie Pie eats Celestia's cupcake, there are still two left on the plate. After the scene cuts to the Cakes and back to Pinkie Pie and Celestia, the whole plate and the tea cup are gone, while the caramel apple (which Pinkie Pie knocked off the table) has returned. In the first episode, Spike tells Fluttershy that he was hatched from a purple and green egg. In Twilight's flashback, however, the egg is light purple with darker purple spots. In Twilight's entrance exam, the diagram on the cart shows the egg having color, but changes to no color in another scene. Pinkie's cutie mark is present just after she appears from behind the table at her party. Her cutie mark again disappears, reverting back to how it should be, when she thought that her family didn't like the thought of having a party. When the two bullies are looking down on Fluttershy and laughing, the sky can be seen where their tongues are supposed to be. 11:21 (Rarity's flashback) and 12:06 (Twilight's Flashback), most of the background ponies (Like Minuette , Amethyst Star , and, Lyra Heartstrings ) appear to be a full-grown mare. When Pinkie jumps onto Rainbow Dash, her tail appears to be on her lower back. Part of her cutie mark can be seen on her tail as well. At about 18:55, Rainbow Dash's ear has no inner line. During the race, when Rainbow Dash is flying downwards, she is seen as an adult, and when she performs the rainboom, she is wearing the number sticker from Sonic Rainboom. In the scene right before the group of main ponies have their group hug, Rainbow Dash is missing her cutie mark. Also, during the group hug, Rainbow Dash's tail is missing. After Scootaloo is hugged by Sweetie Belle and Apple Bloom near the end of the episode, her wings are missing. On the scene where Twilight Sparkle is jumping in joy around a mushroom table shouting "yes! ", the table disappears when a pony asks if she is ok but then can be seen in the next frame where Twilight Sparkle giggles and say yes. Pinkie Pie with a cutie mark, before it appears. Pink earth pony on a...cloud? Hoops and Score have blue tongues. Cheery has 2 right ears. When Spike collapses after getting a feather, some of the white from his teeth are visible below the lip. At first the green dragon's wings are plain, but when he is out of his cave, multiple holes can be seen on each wing. At around 4:10 Spike is falling asleep on Twilight's back, but he's missing in the next shot. During the meteor shower, the main ponies and Cutie Mark Crusaders are talking about the shower's beauty, but when the screen pans to the left Scootaloo randomly says "once" in Sweetie Belle's voice. 09:12 Eyelash separated from the eye. In this episode, Owlowiscious's hoot is young and cartoony, but in later appearances he has the hoot of a real life owl. Twilight Sparkle somehow teleports from behind the punch table to the dance floor before Pinkie Pie gets there, even though Pinkie Pie left the screen before Twilight did. Before Rainbow Dash bobs for apples, her tail loses the yellow and green stripes. When Twilight is slammed into the wall, her left leg is layered beneath her body layer instead of on an equal plane. It's also shadowed. While Rarity is running back into her house, a window that is placed too far down vanishes when she slams the door closed. After Rainbow draws the watch on her arm, it disappears in the next scene. When Rainbow is watching Gummy bouncing on the balloon, her cutie mark disappears for some seconds and re appears back. After the third commercial break, Pinkie's shading is lighter compared to her shade in every other scene she is in. After Rainbow Dash says "Hi, Pinkie Pie! ", she isn't carrying anything, but in the next scene she has a saddlebag. When Pinkie Pie is trying to make Spike tell her the truth, Gummy is pulling Spike's tail, but after Pinkie screams "No! You're not understanding me! ", Gummy is on the back of Spike's chair. During the interrogation scene, Spike is moving while his shadow remains still. When Pinkie is interrogating Spike, Spike looks in a mirror at one point, and sometimes his facial expressions in the reflection are different than in person. When Pinkie has the party for Gummy with the inanimate objects, a large cake appears on the table, even though it was an empty table when the scene started. When Rainbow Dash comes to fetch Pinkie, she enters through the door on ground level. A few shots later however, we can clearly see that she is upstairs, standing next to Pinkie's bed. When Rainbow Dash comes to fetch Pinkie, after knocking over the rocks, she has two pairs of wings. At Pinkie Pie's surprise party in the barn when Pinkie Pie says: "You girls are the best friends ever, how could I have ever doubted you?" in the top right corner, there's a missing balloon that overlaps part of two other balloons. During the scene where Pinkie Pie walks behind the table, during the camera pan at 17:44 through 17:48 the Stools with the bucket of radishes and rocks magically slides to the left somehow those layers were not locked during the pan. Muffs Warmesherz 11:41, September 19, 2011 (UTC). When Pinkie Pie is at Applejack's to give her an invitation to Gummy's after-birthday party, there is a grey apple on one of the trees. When Pinkie is speaking to Fluttershy and Rainbow Dash, at one point, she has five invitations, even though she had left one on one or more of the ponies (I can't remeber who's) doorstep. During Twilight's Letter, right before Applejack goes into the conga line, her party hat is decorated with stars instead of apples. The correct hat is seen following the cut. When Pinkie questions if she is excited, Fluttershy's teeth had more detail. At 21:08 Applejacks hat swaps from its apple theme to that of Twilight Sparkle, swapping back for the next scene. When Pinkie is singing at Fluttershy's house, the candle's fire doesn't seems to have motion. At 3:15, Twilight's cutie mark is shown on her inner thigh. Rainbow Dash says "Hi, Pinkie Pie", even though she has a disguise. Not an error, it just probably wasn't a very good disguise. Rainbow Dash's tail lacking the highlights. Also, Applejack without freckles. Spike's mouth is frowning in his reflection. At the beginning of the episode, when Rarity goes to ask some stallions for help with the carriage, the blue stallion briefly mutates into a cyclops. When the ponies are approaching the castle, their order is reversed in the external shots from the rear. When the girls sing "At the Gala!" the last time, Rarity's shawl and glass slippers are missing. During Pony Pokey, Pinkie says "you reach your back left in", but Dash was using her right hoof. Fluttershy loses one of her front hoof slippers during Pinkie Pie's "Pony Pokey" song. However, in the scene where she evilly sets up a new trap, one short clip shows the lost slipper on her again. When Applejack is pushing her cart into the party, a white pegasus behind her has wings that are blue, but with the middle feather completely white. When Rarity and Prince Blueblood argue over who should open the door for each other, Rarity's tiara is absent from her forehead, only to reappear out of thin air when she glares at him. At the Grand Galloping Gala when Applejack's cake is flying straight towards Rarity, her tiara is once again missing, only to reappear in the next scene when the cake actually hits her. The cake stains on Rarity's dress disappear after Twilight and Princess Celestia walk in on the crashed party.When Applejack kicks off apples from her stall to try trick customers into buying something, she has her boots on, but when she points out her stall the the pony who trips over the apples, she doesn't have her boots on. Her boots re-appear in the next shot of her. No slippers can be seen later when Rarity grabs Pinkie, forcing her to leave. When Pinkie Pie jumps onto the statue during her musical number, Diamond Mint blinks and her eyelids are purple. When the ponies are running around in the chaos, one of the background ponies runs onto a foreground pony. When Soarin' is about to enter the V.I.P. room with his pie, one of the Wonderbolts' tails are missing. In some scenes of Rainbow Dash talking with the Wonderbolts, the top of her mane is the same as it was before she smoothed it out for the gala. The magically appearing castle doors: The scene of the castle's main entry gate just before the At the Gala song starts shows a drop down iron gate, and a lowered drawbridge covering the moat. The scene of the same entrance at the end of the song shows large arched doors opened outwards in addition to the iron gate and the drawbridge. The large doors were missing the previous time the castle entrance was shown. When Twilight runs to meet Celestia, Spitfire has pink blobs covering her eyes and cyan wings. Right after Twilight runs to stand next to Princess Celestia if one looks closely. While she nuzzles her side, her right eye isn't closed the entire way. A few frames before Rarity loses her slipper it's seen that she has no slippers on at all. When Spike says "That sounds like the worst night ever! ", a donut is floating in his hand. After Twilight finishes her verse, the streak and "break" in her hair are on the same side, usually, the streak is on one side and the "break" is on the other. 1:34, on the far right if viewing the whole frame. Discoloration on the middle feather. Background pony running on a foreground pony. Rarity is so shocked that her tiara disappeared! ...and her anger brought it back. Rarity missing her shawl and shoes.